The orthopedic team at Manhattan Orthopedic Care led by Dr. Armin Tehrany, one of the most reviewed orthopedic surgeons in New York, never fails to write a successful story with each patient that enters the office. Combining their phenomenal orthopedic skills, profound orthopedic knowledge, and candid compassion, Dr. Tehrany and his team always deliver outstanding results in their work. In addition to their efforts to tailor the most suitable orthopedic care and treatment plan to each patient, Dr. Tehrany and the team always establish an honest and open communication through which they fully inform and educate the patients on their condition and further orthopedic treatment options. Orthopedic injuries can severely impact person’s lifestyle and cause a significant amount of stress, therefore, we arrange an appointment at the earliest time that best fits the schedule of our patients. After all, providing our patients with orthopedic care during their most difficult and painful time is essential and most important. 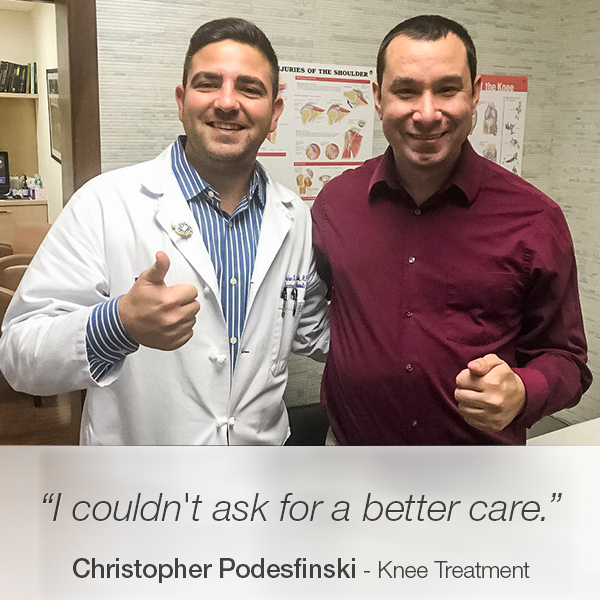 When Christopher called our office due to an excruciating pain in his knee, he was scheduled for an urgent appointment the next day without any further question. As always, he was provided with superb orthopedic care and a treatment plan that not only perfectly matched his injury but also enabled him to return to his everyday activities with almost no downtime. Now, as his painful days are over, Christopher wrote an endearing review confirming our devotion to doing whatever it takes to help patients feel and live better. I came to MOC with terrible knee pain in November and I can’t recommend them enough. I called the morning after I hurt my knee, and they squeezed me in for an appointment the same day. I saw Stephan and he was super friendly and knowledgeable. In addition, even though the office was busy, I was seen within 5 minutes of the appointment time, which means a lot, when you are trying to squeeze in an appointment during your workday. The support staff here is incredible, they are all friendly and they respond to emails promptly. I couldn’t ask for better care.